Good morning... The pursuit by the Iranian regime of nuclear weapons represents a direct threat to the entire international community, including to the United States and to the Persian Gulf region. In defiance of repeated calls from the IAEA Board of Governors and from the Security Council, the Iranian government has accelerated its nuclear program while continuing to conceal its activities from international inspectors. Working with our international partners, the United States is making every effort to achieve a successful diplomatic outcome, but the international community has made clear that the Iranian regime must not acquire nuclear weapons. The vital interests of the United States, of our friends and allies in the region, and of the entire international community are at risk, and the United States will act accordingly to protect those common interests. Today, the Iranian regime can decide on one of two paths – one of two fundamentally different futures for its people and for its relationship with the international community. The Iranian government’s choices are clear. The negative choice is for the regime to maintain its current course, pursuing nuclear weapons in defiance of the international community and its international obligations. If the regime does so, it will incur only great costs. We and our European partners agree that path will lead to international isolation and progressively stronger political and economic sanctions. The positive and constructive choice is for the Iranian regime to alter its present course and cooperate in resolving the nuclear issue, beginning by immediately resuming suspension of all enrichment-related and reprocessing activities, as well as full cooperation with the IAEA and returning to implementation of the Additional Protocol providing greater access for the IAEA. This path would lead to the real benefit and longer-term security of the Iranian people, the region, and the world as a whole. The Iranian people believe they have the right to civil nuclear energy. We acknowledge that right. Yet the international agreements Iran has signed make clear that Iran’s exercise of that right must conform with its commitments. In view of its previous violations of its commitments and the secret nuclear program it undertook, the Iranian regime must persuasively demonstrate that it has permanently abandoned its quest for nuclear weapons. The benefits of this second path for the Iranian people would go beyond civil nuclear energy, and could include progressively greater economic cooperation. The United States will actively support these benefits both publicly and privately. Furthermore, President Bush has consistently emphasized that the United States is committed to a diplomatic solution to the nuclear challenge posed by the Iranian regime. We are agreed with our European partners on the essential elements of a package containing both the benefits if Iran makes the right choice, and the costs if it does not. We hope that in the coming days the Iranian government will thoroughly consider this proposal. Our British, French and German partners have rightly required that Iran fully and verifiably suspend its enrichment and reprocessing activities before the sides can return to negotiations. This is the condition that has been established by the IAEA Board of Governors and by the UN Security Council. The United States is willing to exert strong leadership to give diplomacy its very best chance to succeed. Thus, to underscore our commitment to a diplomatic solution and to enhance the prospects for success, as soon as Iran fully and verifiably suspends its enrichment and reprocessing activities, the United States will come to the table with our EU-3 colleagues and meet with Iran’s representatives. This morning US representatives have conveyed my statement to Iran through the good offices of the Swiss government, and through Iran’s representative to the United Nations. Given the benefits of this positive path for the Iranian people, regional security, and the nuclear nonproliferation regime, we urge Iran to make this choice for peace -- to abandon its ambition for nuclear weapons. President Bush wants a new and positive relationship between the American people and the people of Iran -- a beneficial relationship of increased contacts in education, cultural exchange, sports, travel, trade, and investment. The nuclear issue is not the only obstacle standing in the way of improved relations. The Iranian government supports terror, is involved in violence in Iraq, and is undercutting the restoration of full sovereignty in Lebanon under UN Security Council Resolution 1559. These policies are out of step with the international community and are barriers to a positive relationship between the Iranian people and the people of the United States and the rest of the world. Iran can and should be a responsible state, not the leading state sponsor of terror. The United States is ready to join the EU-3 to press these and other issues with the Iranian government in addition to our work to resolve the nuclear danger. At the same time, we will continue to work with our international partners to end the proliferation trade globally, to bar all proliferators from international financial resources, and to end support for terror. We also intend to work with our friends and allies to strengthen their defensive capacity, counterproliferation and counterterrorism efforts, and energy security capabilities. Those measures present no threat to a peaceful Iran with a transparent, purely civil nuclear energy program, but provide essential protection for the United States, our friends and allies if the Iranian regime chooses the wrong path. If the Iranian regime believes that it will benefit from the possession of nuclear weapons, it is mistaken. The United States will be steadfast in defense of our forces, and steadfast in defense of our friends and allies who wish to work together for common security. The Iranian people have a proud past, and merit a great future. We believe the Iranian people want a future of freedom and human rights-– the right to vote, to run for office, to express their views without fear, and to pursue political causes. We would welcome the progress, prosperity, and freedom of the Iranian people. The United States looks forward to a new relationship between our peoples that advances these goals. We sincerely hope that the Iranian regime will choose to make that future possible. Cpl. Richard A. Bennett, 25, of Girard, Kan.
Capt. Nathanael J. Doring, 31, of Apple Valley, Minn. Both died May 30, following a non-hostile helicopter accident near Al Taqaddum, Iraq, on May 27. Both were assigned to Marine Light/Attack Helicopter Squadron-169, Marine Aircraft Group-39, 3rd Marine Aircraft Wing, I Marine Expeditionary Force, Camp Pendleton, Calif.Media with questions about these Marines can call the 3rd Marine Aircraft Wing Public Affairs Office at (858) 577-6000. The bodies of two Marines missing as a result of a May 27th helicopter crash in Iraq's Anbar province have been recovered. The body of one Marine was recovered late on May 29th and the other was recovered yesterday, officials said. "Our thoughts are with the families of the Marines," said Marine spokesman Lt. Col. Bryan Salas. The U.S. Marine Corps AH-1 Cobra helicopter from the 3rd Marine Aircraft Wing went down during a maintenance test flight with the two Marines on board. The incident does not appear to be a result of enemy action, and is under investigation, officials said. Although 1,500 U.S. troops were deployed this week from Kuwait to help calm the recent surge of violence in Ramadi, Iraq, the decision about how to handle the problem in that area ultimately belongs to the Iraqi government, a U.S. general involved in planning operations said here today. "There is a contest in Ramadi right now, and that is a contest for the Iraqi government to figure out how to deal with. Our job is to help them do that," Army Brig. 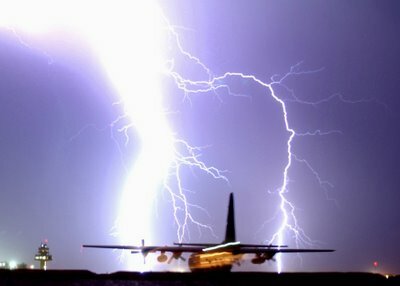 Gen. Carter Ham, deputy director for regional operations for the Joint Staff, said in a Pentagon news briefing. Ramadi probably is the most contentious city in Iraq, as assassinations and intimidation efforts by insurgents continue, Ham said. The U. S. is committed to helping Iraqis restore the rule of law in Ramadi, but the goal is for Iraqi security forces to be operating in and around the city, he said. "There's one thing I know, and that is that Ramadi will not be under U.S. control," Ham said. "It is and will always be under Iraqi control. It's Iraq -- it's their country. Our job is to help them." The Iraqis will need U.S. support to restore order in Ramadi, Ham said, but he said he remains confident that they will be able to make the right decisions and control their own country. "The demonstrated ability of the Iraqi security forces, particularly over the past several months, doesn't leave me with any question about their ability to operate effectively, once it is that their government decides what the plan will be," he said. The force that was deployed from Kuwait was stationed there specifically to act as a reserve force, Ham said. Having available reserve forces gives the commanders on the ground the flexibility to deal with unpredictable tactical situations, he said. "The important thing is that the commanders retain the ability to have a reserve force that they can commit for unforeseen circumstances," he said. "They clearly do have that capability, and will continue to have that capability." Ham also commended the Afghan government for its handling of the protests following the deadly vehicle accident this week. Afghan security forces established control and the Afghan government implemented policies and made public addresses to deal with the situation, he said. "Certainly, we are all deeply remorseful that an accident in which a U.S. vehicle was involved resulted in loss of life and injuries," he said. "Moreover, we should be cognizant of the fact that a freely elected government of Afghanistan managed this situation effectively. That could not have happened only a few short years ago." Have you noticed the change in the way we are now fighting in Iraq...? It shows major progress, in my book and an Iraqi Government that has finally stood up for itself at last!!! Iraqi and coalition forces captured eight terrorist leaders in recent operations in Baghdad neighborhoods. Also, the Iraqi-led Combined Review and Release Board released more than 200 detainees. Yesterday, Iraqi forces raided two targets in the Karada area of Baghdad and detained seven individuals responsible for homemade bomb attacks against Iraqi security forces. The first target was a dormitory on Baghdad Technical University's campus where two student cells, operating out of dormitory rooms, built bombs and later initiated attacks against Iraqi army and police forces. Four students were detained during this operation. At the second target, an apartment building near the campus, Iraqi forces detained three cell leaders responsible for emplacing bombs made by their student cells. All three cell leaders are believed to be Palestinians, and they were financed by a local business. This cell is responsible for at least two attacks against Iraqi security and police forces in the Karada area. The first attack, in December 2005, resulted in no casualties. The second attack, in January of this year, killed several Iraqi police officers riding in a vehicle. No Iraqi forces were killed or wounded during this operation. On May 29, Iraqi and coalition forces captured a key insurgent leader in Iraq, in the Ameriya neighborhood of Baghdad's Mansour district. Sheikh Ahmed Hussein Dabash Samir al-Batawi, also known as Ahmed al-Dabash, was a major financier and facilitator of terrorism in Iraq, most notably the bomb attack in the Shiite holy city of Karbala on March 2, 2004. In that attack, several pre-set explosives were detonated near one of the most important Shiite shrines in Iraq - the Golden Dome Mosque. More than 140 Iraqis were murdered and hundreds were wounded in the attack that occurred during the Shiite observance of Ashoura, a time when thousands of pilgrims gathered in Karbala. It is believed that Dabash also was responsible for the attack on the Shiite al-Tawhid Mosque in Baghdad and for facilitating other terror attacks around Baghdad. 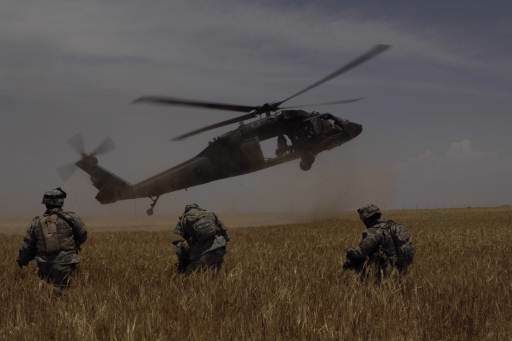 Coalition forces consider Dabash's capture significant for the critical information they believe he will provide on al Qaeda and Jordanian terrorist Abu Musab al-Zarqawi's network. They said he is known to have close ties to these organizations. The Iraqi Central Investigating Court in Baghdad issued an arrest warrant for Dabash on Jan. 9, 2005, citing his violation of Iraqi Penal Code 194 - committing terrorist acts. Iraqi and coalition intelligence officials and security forces tracked Dabash in a determined manhunt, and over the last two years have arrested several of his enablers and underlings who followed Dabash's command to commit terrorist crimes, officials said. In other news, Multinational Force Iraq released 204 male detainees from coalition-run theater internment facilities May 30. The Iraqi-led Combined Review and Release Board reviewed their files and recommended release. The board was established in August 2004 and consists of members from the ministries of Human Rights, Justice and Interior, as well as officers from the multinational forces. To date, the board has reviewed the cases of more than 39,000 detainees, recommending the release of more than 19,600 individuals. Question: Can you tell us what the United States' reaction is to Iran saying that they're willing to come back without preconditions to the EU3 talks? Tony: I'd say we're glad they're going back to the EU3 talks and we hope that they produce productive results. We've always been clear on the end state, which is that we want Iran to suspend all enrichment and reprocessing activities, and we wish them success. Question: Do we think this is a breakthrough of any type, or can you measure it yet? The Defense Department's latest quarterly report to Congress on progress in Iraq cites continued momentum on the political, economic and security fronts and evidence that those attempting to derail it are failing, senior defense officials told Pentagon reporters today. Spc. J. Adan Garcia, 20, of Irving, Texas, died on May 27, when his convoy encountered small arms fire received while returning from an explosive ordinance mission. Garcia was assigned to the 1st Brigade Special Troops Battalion, 1st Brigade Combat Team, 10th Mountain Division (Light Infantry), Fort Drum, N.Y.
No good can come of speculation surrounding a Nov. 19 incident in Haditha, Iraq, in which 24 Iraqi civilians, including women and children, were killed in the aftermath of a roadside bomb attack, the chairman of the Joint Chiefs of Staff said today. Marine Gen. Peter Pace also stressed that investigations into alleged misconduct by U.S. Marines in the incident are not yet complete. Appearing on CNN's "American Morning" for what was to have been an interview focusing on the nation's Memorial Day observance today, Pace told Miles O'Brien that two investigations are still in progress: one to find out what happened, and another to find out why senior officials were not aware of the misconduct allegations until February. "We will find out what happened, and we'll make it public," Pace said. "But to speculate right now wouldn't do anybody any good." Army Lt. Gen. Peter W. Chiarelli, commander of Multinational Corps Iraq, initiated a preliminary investigation Feb. 14 when reporters told U.S. officials about allegations of possible violations of the rules of engagement by Marines. In a March 17 news conference, the general said he had ordered further investigation based on the results of the initial probe. "I understand it's going to be a couple of more weeks before those investigations are complete, and we should not prejudge the outcome," Pace said today. "But we should, in fact, as leaders, take on the responsibility to get out and talk to our troops and make sure that they understand that what 99.9 percent of them are doing, which is fighting with honor and courage, is exactly what we expect of them." Marine Corps Commandant Gen. Michael W. Hagee is in Iraq doing just that, the chairman said, "because regardless of where this investigation goes, we want to ensure that our troops understand what's expected of them in combat." Asked if he suspects that a cover-up at lower levels of command caused the delay between the incident and senior officials becoming aware of possible misconduct, Pace said he doesn't suspect anything, but rather is waiting for the investigation to yield the facts. "If the allegations, as they're being portrayed in the newspaper, turn out to be valid, then of course there will be charges," he said. "But we don't know yet what the outcome will be. It'll take its course. It will be made public, and we'll all be able to make our own judgments." ... In this place where valor sleeps, we acknowledge our responsibility as Americans to preserve the memory of the fallen. On this Memorial Day, we look out on quiet hills, and rows of white headstones -- and we know that we are in the presence of greatness... The markers here record the names of more than 296,000 men and women. Each of the soldiers, sailors, airmen and Marines buried here answered the call to serve, and stepped forward to protect the nation they loved. 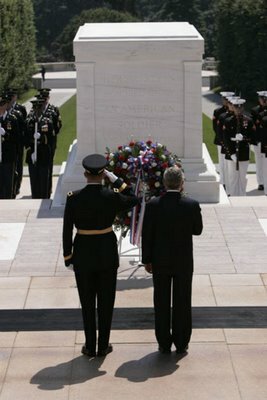 About Photo: President George W. Bush stands with U.S. Army Major General Guy Swan during the Memorial Day wreath laying ceremony at the Tomb of the Unknowns in Arlington Cemetery in Arlington, Va.
Theirs is a noble calling that founded a nation, drove back the forces of fascism, communism and terrorism, and made historic advances in the cause of human freedom. Their service strengthens our will to persevere through every challenge. They remind us of what it means to be an American. So to all of those serving our country today, know that we are deeply grateful to you and to your families. May God bless you. And may God bless our wonderful country. On May 29, (Monday,) Americans will pause together to remember servicemembers from wars past and present who have given the ultimate sacrifice while defending the nation. The National Moment of Remembrance takes place for one minute each year on Memorial Day, starting at 3 p.m., local time. "The time 3 p.m. was chosen because it is the time when most Americans are enjoying their freedoms on the national holiday," according to a news release from the White House Commission on Remembrance. "The moment does not replace traditional Memorial Day events; rather, it is an act of national unity in which all Americans, alone or with family and friends, honor those who died for our freedom." Observing the moment can be as simple as ringing a bell three times or pausing for a moment of silence, the news release said. Americans are encouraged to ask others to remember, including family, friends and co-workers. Established by Congress in December 2000, the White House Commission on Remembrance encourages Americans to remember the sacrifices of its fallen military members, as well as the families they leave behind. According to its mission statement, the commission "promotes acts of remembrance throughout the year and asks Americans to pay our debt of gratitude in memory of our fallen by giving something back to the nation." The idea for the program came in May 1996 when the commission's director, Carmella LaSpada, asked children touring the nation's capital what Memorial Day meant to them. "That's the day the pool opens," they said. Providing a sense of history to America's citizens and ensuring younger generations remember the sacrifices made to preserve their freedom is a major goal, the news release said. In addition to the National Moment of Remembrance, the commission has promoted other programs. In June 2004, the commission sponsored a "historically accurate" sand sculpture on Normandy Beach, France, to commemorate the 60th Anniversary of D-Day, according to its Web site. Sand sculptors worked for six days, making a 30-foot by 30-foot sculpture of allied troops storming the beach. The commission employs cartoonists to create new, limited-edition cartoons for a calendar each year. It also partners with Dear Abby to send messages of support to the nation's troops. I was going to wish you all a safe holiday in a post this morning... but I got to Practice What I Preach first. Be safe out there people and I hope you all have a very nice holiday. 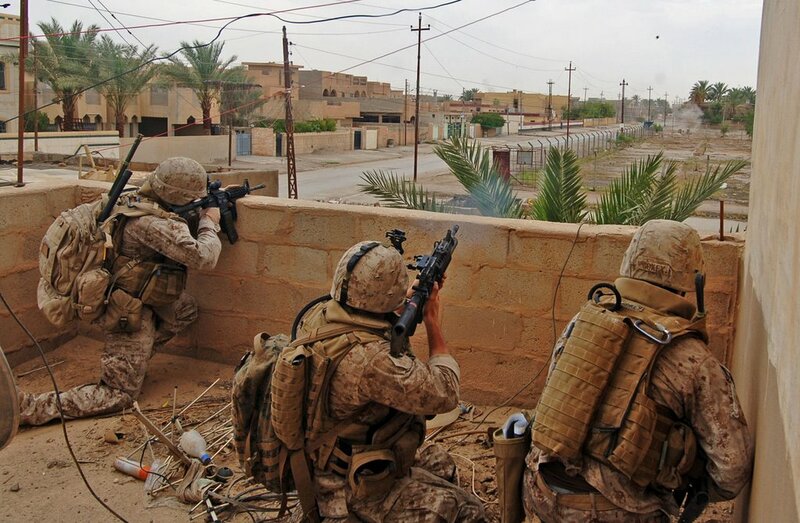 RAMADI, Iraq- U.S. Marine Corps Cpl. 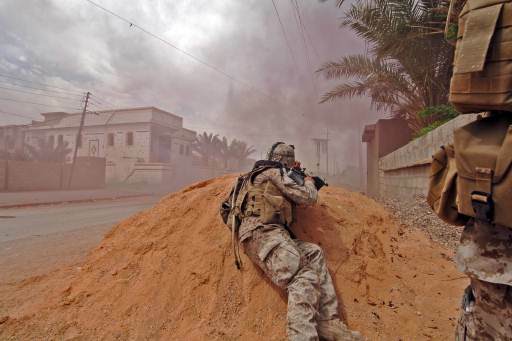 Jeremy Rugg fires a grenade towards an enemy position during a firefight as Cpl. Julius Mitchell, left, lays covering fire and Cpl. 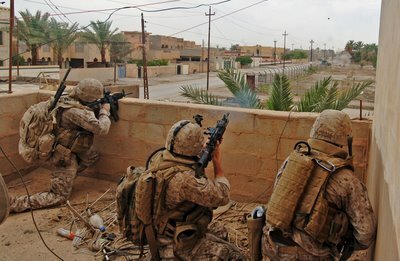 Adam Gokey, right, spots insurgent positions Saturday May 20, 2006. The Marines are assigned to 2nd Air-Naval Gunfire Liaison Company. A U.S. Marine Corps AH-1 Cobra helicopter from 3rd Marine Aircraft Wing crashed today in Iraq's Anbar province with two Marines on board during a maintenance test flight, U.S. military officials said. Search-and-rescue efforts are ongoing for the missing crewmembers. "We are using all the resources available to find our missing comrades," Marine spokesman Lt. Col. Bryan Salas said. The incident is under investigation. However officials said it does not appear to be a result of enemy action. The Department of Defense announced today the death of two soldiers who were supporting Operation Iraqi Freedom. They died in Baghdad, Iraq, on May 25, when an improvised explosive device detonated near their HMMWV during combat operations. Both soldiers were assigned to the 2nd Battalion, 6th Infantry, 2nd Brigade, 1st Armored Division, Baumholder, Germany. Capt. Douglas A. Dicenzo, 30, of Plymouth, N.H.
Spc. Robert E. Blair, 22, of Ocala, Fla.
Lance Cpl. Kevin A. Lucas, 20, of Greensboro, N.C., died May 26, while conducting combat operations against enemy forces in Al Anbar province, Iraq. He was assigned to 3rd Battalion, 8th Marines, 2nd Marine Division, II Marine Expeditionary Force, Camp Lejeune, N.C.
For further information related to this release, contact the Marine Corps Base Camp Lejeune Public Affairs Office at (910) 451-7440. 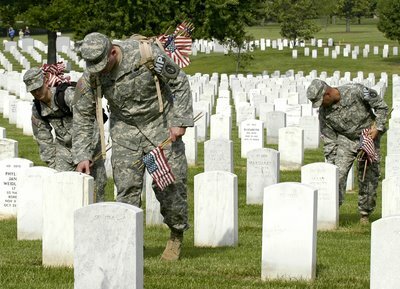 Soldiers of the 3rd U.S. Infantry, The Old Guard, place American flags in front of grave markers during the "Flags In" ceremony in Arlington National Cemetery, Arlington, Va., May 25, 2006. ... I have confidence in the final outcome of this struggle, because I know the character and determination of the men and women gathered before me. We see that character and determination in a cadet named Patrick Dowdell. It was Patrick's dream to attend West Point, and he applied straight out of high school, but did not get in on his first try. After being turned down, he wondered if he was cut out for the Academy. His father, New York Fireman Kevin Dowdell, encouraged Patrick to apply again. Kevin wrote letters to his congressman on behalf of his son. And he spent long hours working with Patrick on his application -- right up to September the 9, 2001. Two days later, Kevin Dowdell raced across the Brooklyn Bridge with his fire rescue unit to the burning World Trade Towers -- and he never returned. After the attack, Patrick spent months digging at Ground Zero, looking for his dad -- and thinking about the dream that they had shared about his future. He was determined to fulfill that dream. And in the summer of 2002, Patrick arrived here at West Point as a new cadet -- and today he will receive his degree and his commission. A few weeks ago, Patrick's mom, RoseEllen, attended another graduation ceremony -- at the New York City Fire Academy, where her other son, James, followed his father's footsteps as one of New York's Bravest. And today, RoseEllen... is with us to see Patrick join the ranks of America's bravest, as an officer in the United States Army. THE PRESIDENT: Good morning. This Memorial Day weekend, Americans pay tribute to those who have given their lives in service to our Nation. America is free because generations of young Americans have been willing to sacrifice to defend the country they love, so their fellow citizens could live in liberty. This weekend, I am visiting some of the brave men and women who will soon take their own place in the defense of our freedom -- the 2006 graduating class at West Point. This was the first class to arrive at West Point after the attacks of September the 11th, 2001. Each of them came to West Point in a time of war, knowing all the risks and dangers that come with wearing our Nation's uniform. And the reality of that war has surrounded them since their first moments at the Academy. Thirty-four times since they arrived at West Point, they have observed a moment of silence to honor a former cadet fallen in the war on terror. One of those former cadets was First Lieutenant Rob Seidel, a 2004 West Point graduate who gave his life in Iraq earlier this month. Rob grew up in Maryland, and as a child he and his family made frequent visits to the Civil War battlefield at Gettysburg, and from his earliest days he dreamed of serving in the U.S. Army. 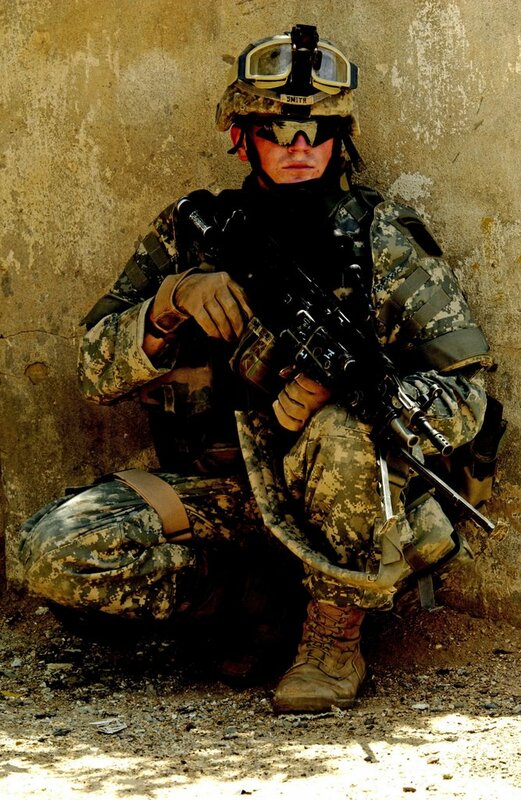 He deployed to Iraq with the 10th Mountain division and was killed by a bomb in Baghdad. His father says this about Rob: "He loved his family, and believed in God, and he loved his country, and he was willing to pay the ultimate sacrifice on behalf of his country." We live in freedom because of young Americans like Lieutenant Rob Seidel. And in recent days in Iraq, we've seen what their sacrifices have made possible. A week ago, the new Prime Minister of Iraq announced the formation of a national unity government. British Prime Minister Tony Blair recently visited Baghdad to meet with Prime Minister Maliki and Iraq's new leaders, and this week he came to the United States to give me his impressions. Prime Minister Blair told me that Iraq's new leaders are determined to rid their country of terrorism, unite Iraqis as one people, and deliver peace and prosperity for all their citizens. The formation of a democratic government in Iraq marks a victory for the cause of freedom in the Middle East. It is a victory for millions of Iraqis who defied the terrorists and cast their ballots in three elections last year. It is a victory for the Iraqi Security Forces, who fought and bled for this moment, and now have a democracy worthy of their sacrifice. And it is a victory for the American, British, and other coalition forces who removed a murderous dictator who threatened the world. Because of their courage and sacrifices, Iraq has a free government that will be a strong and capable ally in the global war on terror. The new government in Iraq is also a defeat for the terrorists, who fought the arrival of a free and democratic Iraq with all the hateful power they could muster. Now, a day that they feared has arrived. The terrorists can kill the innocent, but they cannot stop the advance of freedom. We can expect the terrorists to continue bombing and killing, but something fundamental has changed: The terrorists are now fighting a free and constitutional government. They are at war with the people of Iraq. The Iraqi people and their new leaders are determined to defeat this enemy, and so is the United States of America. This Memorial Day weekend, we remember First Lieutenant Seidel and the brave Americans of every generation who have given their lives for freedom, liberated the oppressed, and left the world a safer and better place. And the best way to honor America's fallen heroes is to carry on their fight, defend our freedom, and complete the mission for which they gave their lives. *** It’s time to go and break bread with your troops again Mr. President. I for one do not agree in full with all that is in this story... but it does hold a lot of truths. The Senate confirmed Air Force General Michael Hayden as CIA Chief today, making him the first active-duty or retired military officer to be director of the civilian intelligence agency in more than 25 years. Vote was 78-15. At about 9:30am CDT this morning... Possible gun fire was reported in the underground garage parking level of the Rayburn House Office Building. Capital Police ordered lockdown yet Capital across the street is open at this time. Staff told to stay in office – get out terror kit just in case. The Senate is in session and continues their work while the House was not. U.S. Capital Police are investigating... Ambulances reported arriving and so have the FBI Terrorism Task Force and other outside Law Enforcement. >>> 10:45 am CDT: Live Capitol Hill Press Conference will be held at 11:00am CDT. >>> 11:15am CDT: Not much out of the Live Capitol Hill Press Conference besides they’re still investigating. Another Briefing at 12:15pm CDT. >>> 2:15pm CDT: All clear has been given after thorough search comes up with nothing. Pfc. Caleb A. Lufkin, 24, of Knoxville, Ill., died on May 25, at Walter Reed Army Medical Center, Washington, D.C., of injuries sustained on May 4, when an improvised explosive device detonated near his RG-31 Mine Protected Vehicle during combat operations in Baghdad, Iraq. Lufkin was assigned to the 5th Engineer Battalion, Fort Leonard Wood, Mo. Palestinian President Mahmoud Abbas, best watch his back close for the next few months... I got a feeling there are a lot of bad people out there waiting for the chance to take him out. And that would be a terrible thing for any short term hope of moving the Peace Process forward in any possible way... Civil War would definitely be in the cards for the Palestinian people. 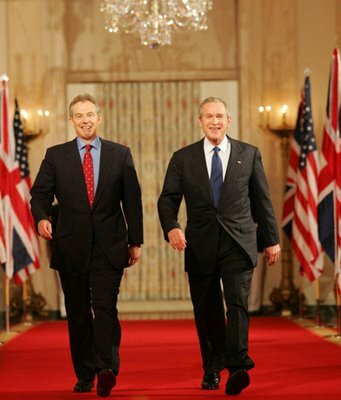 About photo: President George W. Bush and Prime Minister Tony Blair of Great Britain, walk through Cross Hall en route to the East Room Thursday night, May 25, 2006, for a joint press availability during which the President said of Iraq's new government, "The United States and Great Britain will work together to help this new democracy succeed." Done forgot all about North Korea and those Six-Party Talks... haven't ya...? Pfc. Steven W. Freund, 20, of Pittsburgh, Pa.
Lance Cpl. Robert G. Posivio III, 22, of Sherburn, Minn. Both Marines died May 23, while conducting combat operations against enemy forces in Al Anbar province, Iraq. They were assigned to 1st Battalion, 1st Marine Regiment, 1st Marine Division, I Marine Expeditionary Force, Camp Pendleton, Calif.
Media with questions about these Marines can call the Camp Pendleton Public Affairs Office at (760) 725-5044. This morning the Prime Minister of Israel, Ehud Olmert gave a very, VERY powerful speech to the U.S. Congress. The sad thing to me is that none of the Cable News Channels showed it. All I can say is-- Thank god for C-SPAN. If you didn’t get to see this speech today, be sure to check it out tonight on C-Span. I’m sure they will rebroadcast it in full sometime during the night. It’s about an hour long. But for now check out Atlas’s write-up on the speech. She was there. A Massive Fire has engulfed the cargo section of Turkey's Istanbul Airport. This is one ‘Bad A’ fire folks. Terrorism is not ruled out... or in. More to come as this story develops throughout the day. 9:10am CDT: Fire is now under control. of sorts was initial cause of fire. No pun intended but we shall see when the smoke clears out. by either a spark from a welder's torch or sparks from wiring. They also report that 3 people were treated for smoke inhalation. news agency reported on its website. refused to comment on the claim. Well just have to wait and see how this all pans out! Spc. Michael L. Hermanson, 21, of Fargo, N.D., died on May 23, in AL Abayachi, Iraq, of injuries sustained when his RG-31 Mine Protected Vehicle came under improvised explosive device, rocket propel grenade and enemy small arms fire while on a route-clearing mission during combat operations. Hermanson was assigned to the Army National Guard's 164th Engineer Battalion, Minot, N.D. So powerful that I just had to pass it on. About Photo: U.S. Army Staff Sgt. 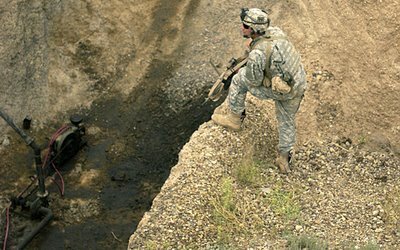 Vincent Adler, Company A, 3rd Battalion, 187th Infantry Regiment, looks down into a well he is about to search for weapons and explosives during Operation Iron Triangle, in Iraq, May 10, 2006. May 23, 2006- Fresh off the heels of Operation Red Light Two, in which U.S. soldiers assigned to Company A, 3rd Battalion, 187th Infantry Regiment uncovered the largest cache in terms of explosives found to date in Iraq, the company was at it again for Operation Iron Triangle, the second-largest air assault mission, behind Operation Swarmer, of the 101st Airborne Division’s (Air Assault) deployment. Ramirez died May 21, while conducting combat operations against enemy forces in Al Anbar province, Iraq. He was assigned to 3rd Battalion, 5th Marine Regiment, 1st Marine Division, I Marine Expeditionary Force, Camp Pendleton, Calif.
Christoff and Leusink both died May 22, from wounds received while conducting combat operations against enemy forces in Al Anbar province, Iraq. They were both assigned to 3rd Battalion, 3rd Marine Regiment, 3rd Marine Division, III Marine Expeditionary Force, Marine Corps Base Kaneohe Bay, Hawaii. Media with questions about Ramirez can call the Camp Pendleton Public Affairs Office at (760) 725-5044. Media with questions about Christoff and Leusink can call the Marine Corps Base Kaneohe Bay Public Affairs Office at (808) 257-8870. The first destroyed skyscraper to be rebuilt since Sept. 11, (the 52-story 7 World Trade Center,) opened Tuesday, with few tenants but state-of-the-art features that developers say will be part of all the new office towers to rise at the World Trade Center site. 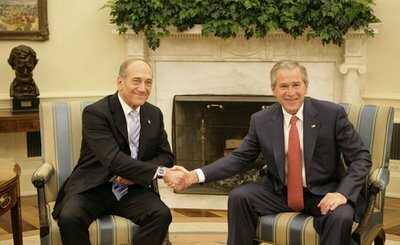 About Photo: President George W. Bush exchanges handshakes with Prime Minister Ehud Olmert of Israel during their meeting Tuesday, May 23, 2006, in the Oval Office. It is hard to imagine that Natanz, Iran... the sleepy little provincial town and home to about 40,000 inhabitants... could ever be at the center of a conflict. But behind the craggy mountains overlooking Natanz lies Iran's most sensitive nuclear site. Its anti-aircraft guns are visible from the main road, even though much of the plant is underground. My take is this... I would tell the peaceful Iranians who live in and around Natanz to BAIL. (Move – Get out of Town. That goes for all those who live around these many Nuclear Sites in Iran.) Your leaders will not change their direction of the Iranian Nuclear Enrichment Program and there is nothing the West can do to stop them... Peacefully that is. Now... being Israel and the United States will never allow Iran to have a Nuclear Weapon... the time will come and sooner than later I’m afraid when these sites will be took down. And they will be taken down hard. Places like the Natanz Nuclear Enrichment Site will be hit first... and they will be hit over and over and over until these sites are completely neutralized. I’ll end by saying this... Many who live around these sites will say that they trust in God to protect them. I say God gave them the intelligence to know their situation and to act accordingly. Happy Birthday to my first Blog!!! I just noticed that today marks one year to the day that I started Blogging. It’s been a long year in which I meet and gained so many new friends out there. My answer to this is from my remarks on the homepage of my website at AubreyJ.org. It goes as follows: No matter what your political views might be... One thing is for certain. In these days of fast news and even faster life styles, we all seem to have forgotten those moments in history that so abruptly and tragically changed this beloved Country of ours. 911- How soon we forget. Now don’t get me wrong… I know all of us have not forgotten 9-11. Yet I do feel that most of us have forgotten the magnitude of the day and the repercussions that soon followed afterwards. Even to this day the repercussions can still be felt. I came to this conclusion back in July, 2004 during the time when all the hype on the Presidential election was in full swing. My god… All of the crap that was going on during this time was just beyond belief. You remember??? All the mean hearted ads that were coming out one behind the other. All the one sided columnist and most of the news media, negatively hammering away at anything and everything the President had done or was trying to do. They never once mentioned any of the good things GW had achieved during his first 4 years in office. Made one think we were back in the old Vietnam days again. At least that’s where all the ads and news rhetoric was trying to take us. My first thought on this was, “Hello out there… Has everyone forgotten the horrors of 9-11?” Seemed to me they had. Think about it. All events, the economy, jobs +/-, (and the list goes on,) all come back to this one day in history. You can spin it anyway you would like but it will always come back to 9-11, one way or the other. Another thought that came to mind was, “what in the world did Vietnam have to do with anything that was going on, at this moment, on this day?” NOTHING!!! It surely had nothing to do with 9-11 or with any of the mess that followed afterwards. It had nothing to do with the war on terror, the economy, job gains, Social Security, Medicaid or even with Welfare. The way I saw it, the Bush Administration performed very well considering all the abnormal circumstances that so abruptly fell into their laps after 9-11. By itself, just trying to keep this country heading forward and staying on the right path would have been a hard enough task for any administration. Yet Bush did it well and with the backing of most Americans too. Were there mistakes made during Bush’s first 4 years? Of course there were. Our great country had never been put into a situation like the one 9-11 brought onto us. NEVER!!! It was the first time in our history that I think we ever had to, “learn as you go.” And we had to learn at a very rapid pace at that… But if you were to listen to all those Left Wing folks out there, they seemed to have forgotten all of that. All they wanted to do was to give you a mile long list of spin on all the wrong doings they thought the Bush Administration had done. Just another case of Monday morning quarterbacking. They couldn’t help it. They couldn’t come up with a better plan for nothing. Unless you think going back to the old days of thinking, as it was before 9-11, was a good plan. NOT!!! Anyway... As you can tell by now, I had no likings for John Kerry or his Party. Well… We’ll just say for the way his Party had become. It’s not my fault. The Democratic Party did at least once stand for something. But not now a day. All they stand for now, as before the election, is a bunch of rhetoric and who can hate President Bush the most. Maybe they can get their act together over the next year or two. This country and the war on terror would surely run a lot smoother by them doing so. But if they don’t, we’re going to take a lot of them out of office in the 2006 elections and god help them in 2008. Time will tell I guess. STORMY WEATHER- Lightning strikes in front of the tower and a taxiing C-130 at Balad Air Base, Iraq, May 16, 2006. Staff Sgt. Christian Longsworth, 26, of Newark, N.J., died in Oruzgan province, Afghanistan, on May 19, from wounds sustained when his convoy came under enemy small arms fire during combat operations. Longsworth was assigned to the 3rd Battalion, 7th Special Forces Group, Fort Bragg, N.C. Petty Officer Third Class Lee Hamilton Deal, 23, of West Monroe, La., died May 17, 2006 as a result of enemy action in Al Anbar province, Iraq. He was operationally assigned to Regimental Combat Team-5, I Marine Expeditionary Force (Forward), and permanently assigned to 2nd Marine Division Fleet Marine Force Atlantic, Camp Lejeune, N.C.
I’m so sick and tired of the MSM constantly playing to the Blood... not the Dove. There’s so much more good going on in Iraq than the MSM leads us to believe. Take that Rep. John Murtha, D-Pa!!!!!!!!!!!!!!!! Senate Votes English as the "National Language"
Israel’s Preemptive Strike on Iran?? ?